Orbit Earth Expo is ready to go in Wichita Falls ISD! 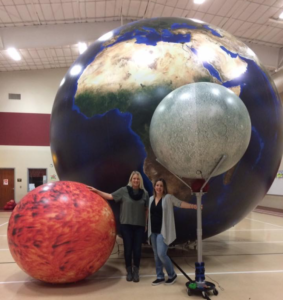 Over the next three days, Orb will teach the district’s 5th graders the wonders of our solar system. Where else can you learn seasons, tides, wind, rotation, revolution, properties of the sun and moon, limitations of models, scale, solar and lunar eclipses, moon’s rotation, moon phases, planets, and asteroids all in one hour? Maybe out in space! But that would have even more limitations than our models do! Have a great time, 5th graders! What a great review, just before the STAAR test! Click here to learn more about our programs in Texas!